Our friends Chris and Angel are about to have a son — an unexpected, completely blessed surprise. Chris and my husband Jay are best friends, and they share a love of the Dallas Cowboys. Just for full disclosure, I am an Eagles fan. But when the Cowboys win, my house is happy, so … hard to be a hater. The stars are made using the pattern One Star Americana Patriotic Mini Quilt from Bubblestitch. This is the first paper piecing I’ve ever done, so even though it looks tough, I can vouch for it being an easy pattern. I altered the pattern ever so slightly. The middle “1, 2, 3” spaces are made as one piece in blue for the center star, then a ring of white, one more of blue and then alternating gray and white. Perfect Dallas stars! For more interest, I tilted the stars a little this way or that. I think it keeps the eye moving over the quilt and lends a feeling of motion. The backing fabric is Dallas Cowboys fabric, just in case the point isn’t made by all those stars on the front. After baby outgrows his little blanket, I’ve offered to sew a hanging sleeve on the back so it can be hung up on the wall if they like. And they’re getting a bonus stroller blanket in the softest flannel and voile, just because I want to help spoil this baby. More Dallas blue and stars! Hooray for babies! Hooray for football and for unexpected little football fans! the quilt looks amazing! great work! Beautiful! You do great work Sarah…and I love the Cowboys, too! and babies! Awesome! 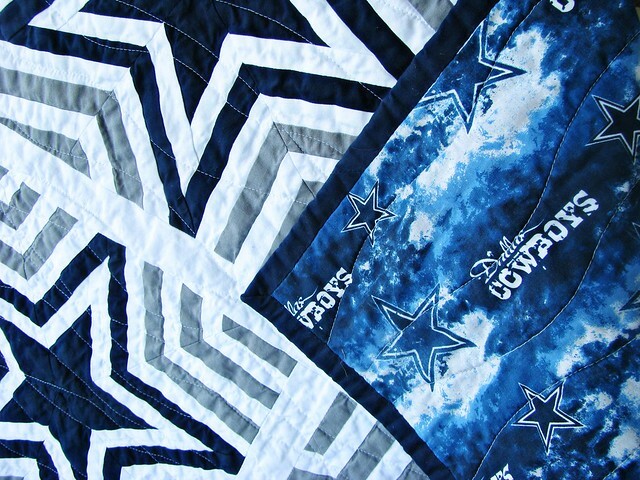 My husband (another Cowboys fan) would go crazy over this quilt! I’m going to have to save this to refer to in the future. My original plan was to just do a few stars in a stripe floating in patchwork. 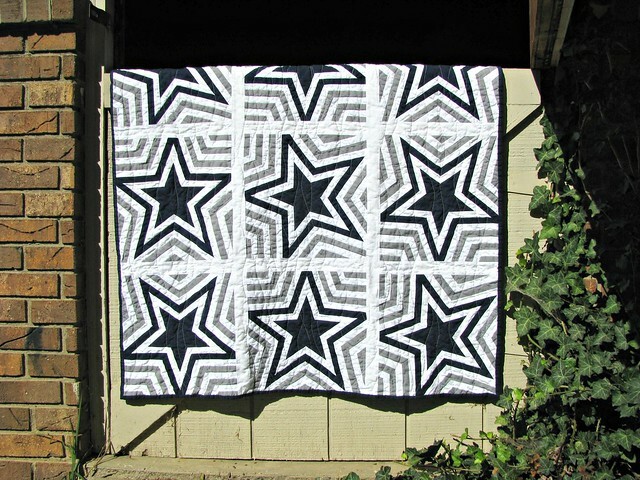 If I were going to do a larger quilt, I think I’d either do that or maybe a stripe of stars on a solid blue, white or gray quilt. I’d love to see what you come up with if you make one! This is fantastic!! You did a really great job!! I think I just found the perfect gift for my husband for Christmas :) Thank you so much!! Wow, that looks amazing! Great job. Sarah…what a beautiful quilt. 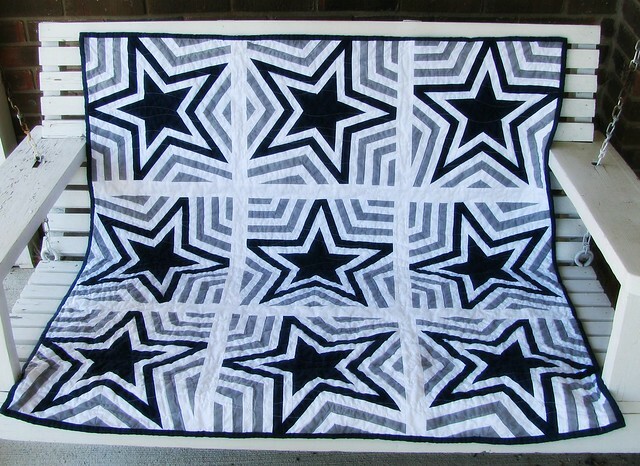 Both my daughter and I are avid cowboy fans and I would love to have your step by step instructions on how to make this quilt. I did go to bubblestitch website. I will order the pattern from there. I just started quilting and I need instructions! Any help is more than welcomed. Hi Dee! Before you start, it might help to read through the step by step instructions here: http://www.freshlemonsquilts.com/?p=1456 I read this at least five times to be sure I had the idea down before I started, and I still messed up a few times. To make the middle of the star larger, so it looked more like the Cowboys star, I just pretended the pattern spaces for “1, 2 and 3” were just one blue space. Then I did a border of white, then one more of the blue. From there I just alternated white and gray. I should make more sense to you once you start working with the pattern. The pattern looks really tough when you first print it out, but this is the first paper piecing I have ever done and once I had the feel of it down, it was much easier than I expected. Good luck with it! Thank you so much for your reply. I will certainly go to freshleomonsquilt.com. I have never done paper piecing however are several ladies from work that meet once a month and quilt. I will keep you posted and post pictures when I make a block. I ordered the pattern today. I’d love to see pictures, please do share! You’ll be fine, wrapping your mind around the order and layering of the fabrics is the hardest part. Make sure to use a very small stitch length so that your paper will tear easily when you’re done with all your pieces. I think I had my machine set at 1.5. Enjoy it! 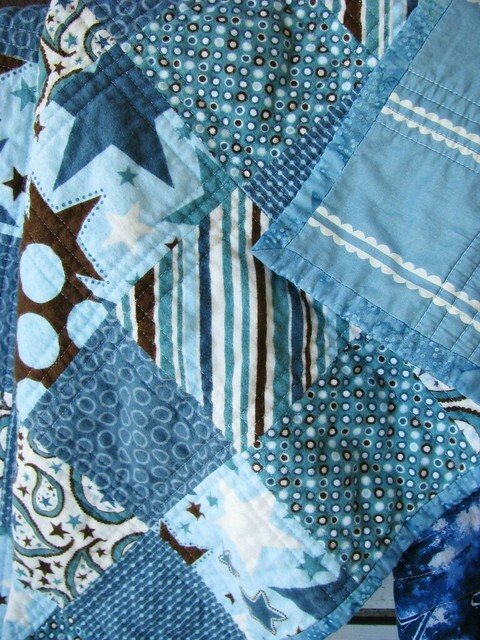 Love this quilt and am making for a friend’s first grandchild. I have been quite successful with paper piecing in the past. 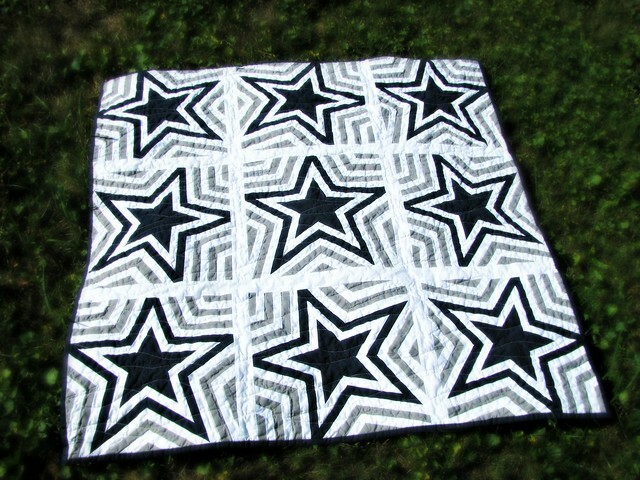 However I am freaked about tilting the stars and that is what makes this quilt so special. How much did you add? What did you do? Oh, Cindy — it’s so easy! Just make the blocks, then when you lay them out, turn them this way and that. They were all made exactly the same, it’s only the placement of the finished blocks that is tilted. You won’t have any trouble with it! Thank you so much! I cannot wait to start this project — need to finish a couple of others first. Hi Jenny! When the seams come together like that it’s called a “Y seam”, and it’s tricky. I just kind of faked my way through it, sewing one seam and stopping a quarter inch away from the end. Then I’d sew the other seam, starting from that stopping point. It’s tricky, but it worked for me. If you google “sewing a y seam” you should see plenty of tutorials and videos that should explain it much better. It does get easier as you go along, and faster, too. I’m glad you’re making one! Can I get the pattern ? Try the link to the pattern creator in the post. If she’s still selling it, that’d be the best way to track it down.